To conducting yoga, meditation for strengthening the inner values for making the citizens to sensitize on the philosophy of Buddhism, Ambedkarism, Feminism. It is for preaching the higher values on spirituality in Buddhism to respect each other’s on humanity and it leads to harmonious life to attain for enlightenment and peace? On every month, ?Full Moon Day? celebration has been conducted in Navayana Buddhist Socity of India (NBSI). The historic event of Dr. Ambedkar’s 50th Golden Jubilee year of embraced Buddhism celebration was given the opportunity to ADECOM Network’s team and affiliated Dalit Collective representatives’ participation. The organizers from Dalit Collective planned the National Workshop and the members embraced Buddhism in Nagarjuna Training Institute, Nagpur. According to the preparations and arrangements the international picku and pickunees were gathered in this Institute they observed the embraced ceremony accepted by 200 members. awareness in their villages, districts for regular practices of meditations, retreats in our regions and established their Buddhist cultural values. The members in ADECOM we realized that the separate forum is essential to take the follow up actions of spiritual rights of the people. On that basis the preliminary discussions held on five times in different places and interacted with social activists, writers, intellectuals and came to the conclusion to start separate forum for Buddhism activities. ADECOM Network is a non-religious non-political and non-profitable organization. For this reason all the committee members were interested to establish the new structure at state level. 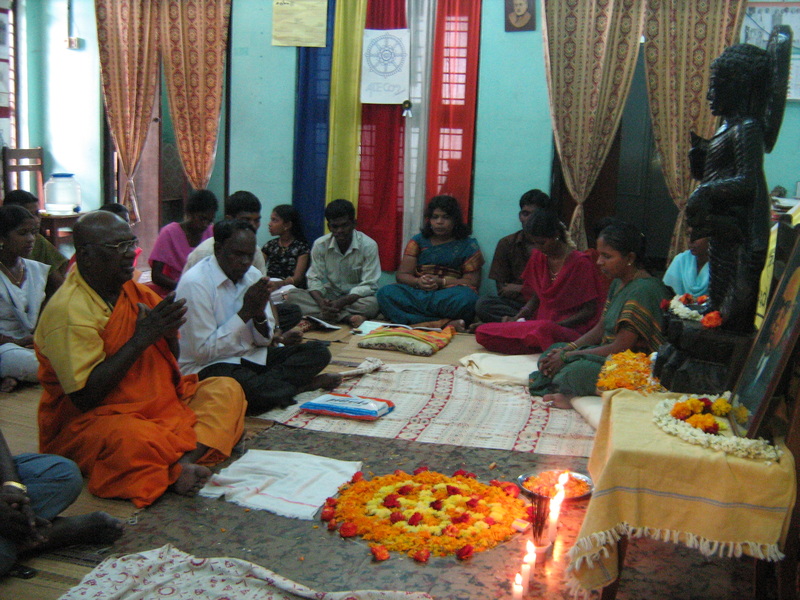 This is the history behind to organize the NBSI for doing the Buddhism related activities with associated groups. reformation women leaders. NBSI was registered on March 2009 with the number 119/2009. Ms. P. Lalidalamballe, President of NBSI was coordinating its activities. NBSI is a forum of intellectuals, writers, social activists and Volunteers to make our society as a non-violence living space for mankind. 1. To construct the public meditation and retreat for developing the youths to improve their capacity and build their leadership qualities on ethics and valued derived in our constitution are the philosophy of Buddhism insisted on equality. 2. To invite the monks and nuns for preaching the higher values on spirituality in Buddhism to respect each other’s on humanity and it leads to harmonious life to attain for enlightenment and peace. 3. To develop the spiritual activities like conducting yoga, meditation for strengthening the inner values for making the citizens to sensitize on the philosophy of Buddhism, Ambedkarism, Feminism. 4. To organize the training regularly for doing the Dhamma activities to impart the educational, democratic standard to the Dalit, Tribes, Minorities, Backward communities for exchanges and getting exposures through the centre activities. 5. To achieve the goals of the mankind like liberty, fraternity and equality; this society dedicates itself for these ethics.
? To establish the community arts crafts centers, skill development units for the people’s development in community.
? To organize exchange visits and retreats in the villages to bring the motivation on community participation in all the events.
? To organize the mass meetings to insist on Dr. Ambedkar’s embraced Buddhism in South Regions of India. It is a need to develop the cultural and spiritual rights of the community. Many years they are practicing Tamil Buddhism culture. But they did not aware about their own root cause and their identity. NBSI is taking such an initiative to motivate and guide the community people to aware about the philosophy of Buddhism, Ambedkarism and Feminism.